Picture your favorite Marin hike. Perhaps it takes you through oak woodlands with a diversity of flora, including sword ferns, trilliums and milkmaids bordering your path. Or maybe it loops through grasslands with a breathtaking array of wildflowers like California poppies, sky lupines and blue-eyed grass. Now picture a trail dominated by a monoculture of non-native French broom and tangles of blackberry canes. Not so inviting! 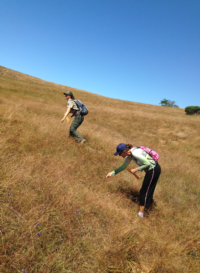 Keeping invasive plant species at bay and restoring native plant communities is a major focus of Marin County Parks. 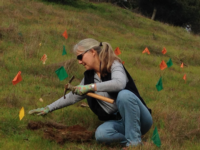 Since 2006, UC Marin Master Gardeners has partnered in this effort by propagating thousands of native California plants for County open space projects. Why are native plants so important? They are the foundation of healthy ecosystems. Native plants have co-evolved with local birds, insects and other wildlife, providing food and shelter critical to the survival of these animals. Native coyote brush can support more than 200 species, while non-natives like French broom support only a handful. Native plants are far more efficient at utilizing water than invasive species. In fact, a major reason for eradicating invasive plants is that they are water hogs and often fire-prone as well. After invasive plants are removed, native plants are needed to repopulate the area, otherwise the aggressive non-natives will reinvade. Propagating California natives is a multi-step process. First, seeds are collected at designated locations. Next, the seeds are cleaned, planted into small containers, thinned and weeded, and moved into larger containers. Finally, the sprouted seedlings are planted back into the landscape. During the rainy season, Master Gardeners work with school and scout groups to plant the seedlings at habitat restoration sites. We take care to return the seedlings to the same watershed where the seeds were collected to preserve the genetic diversity of locally adapted populations. Master Gardeners propagated coyote brush and marsh gumplant to be planted along the levees. The objective was to provide shelter for the endangered salt marsh harvest mouse and the Ridgeway’s rail. As incoming tides force these animals to higher ground, they now have hiding places from predators, dog walkers and hikers. For this tidal restoration project, Master Gardeners grew hundreds of seedlings, then supervised fifth graders from Mill Valley’s Greenwood School in planting them out. Regrading work on a fire road disturbed soil along the shoulders, an invitation for weeds to move in. Marin County Parks also wanted to obliterate several social trails that were cutting through habitat for the rare Tiburon mariposa lily. Master Gardeners helped propagate thousands of native grass seedlings to plant in these disturbed areas. Another fun aspect of this project was to work with second graders at Corte Madera’s Cove School to make “seed cookies.” Under Master Gardeners’ watchful eyes, the students mixed pinches of native seed with clumps of moist compost and clay. They rolled their clumps into little balls, then flattened them into disks. The disks were left to dry and, at a future date, the students will spread them in an area of Ring Mountain. Rains will dissolve the clay mixture, leaving the seeds in contact with the soil. A berm cleared of French broom, poison oak and blackberry needed to be revegetated before those invasives could regain a foothold. Master Gardeners grew and planted native grasses, soaproot lily, gumplant, blue-eyed grass, and other species on the berm, which now looks like part of the surrounding grasslands instead of a weed patch! Community volunteers have been hand weeding the area to keep invasives at bay. Other projects are under way at Hal Brown Park at Creekside, Mount Burdell Open Space Preserve and Gary Giacomini Open Space Preserve. UC Marin Master Gardeners is pleased to be part of native plant restoration in Marin’s beautiful open spaces, improving wildlife habitat and adding to the enjoyment of human visitors.